Trying to grow your active user base is a lot like trying to fill up a leaky bucket. The bigger the hole, the faster you have to add more water and the more time and resources you have to spend doing so. And boy are apps leaky. 80% of all app users churn within 90 days. At $1.64 per install, an app losing 80% of its users in the first 90 days is actually paying over $8 per user that will still be around next quarter. So when asking “how do I grow faster?” the simple answer of “figure out how to economically acquire more users” is likely not the right focus. While user acquisition is important, the real key to growing monthly active users is by creating a better in-app experience and plugging that hole. Through better onboarding and engagement, and thus app retention, mobile teams have the potential to significantly accelerate sustainable growth. Consumers now expect all apps to match the experience of innovative leaders like Facebook and Netflix. What do these apps have in common? They have tremendous resources to consistently experiment and launch new features. Experimentation is a critical component of the product development roadmap as it is the only way to causally measure how users will respond to changes in the real world. Netflix notes in its technology blog that “every product change Netflix considers goes through a rigorous A/B testing process before becoming the default user experience.” Unfortunately, without the right tools, running mobile experiments is challenging and resource intensive. Simple visual changes require expensive engineering time, the app store approval process delays releases, and integrating with the rest of the mobile stack is complicated. Yet we believe that mobile teams of all shapes and sizes should follow the lead of Facebook and Netflix and have the ability to rapidly iterate to create amazing mobile experiences. This is the principal on which Apptimize was founded. The results of running mobile experiments are compelling. What we’ve found based on our work with hundreds of leading apps is that organizations don’t have to have the engineering resources of Netflix to bake experimentation into the product development process. In fact, our research reveals that companies across their mobile journey who launch or experiment with eight or more new features per year grow at a rate over two times as fast as apps with slower and less innovative development cycles. Let’s take a look at how some of the top apps have created better experiences through two simple experiments. It’s no surprise that a better onboarding experience leads to significant reductions in initial drop-offs and significant increases in ongoing engagement. 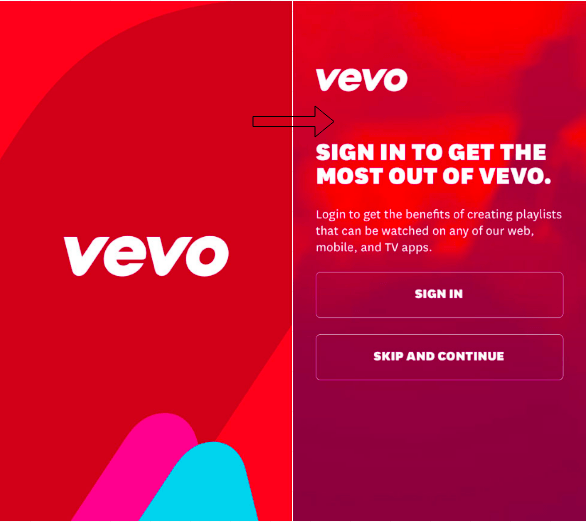 Vevo, the world’s leading all premium music video and entertainment platform with over 20 billion monthly views (over half of which are on mobile), previously used a four-step onboarding tutorial to convey value and encourage users to sign up or sign in. Vevo’s product team wanted to streamline the onboarding tutorial to maximize logins and new signups. The team tested reducing the number of screens in the onboarding flow from four to two, taking users directly to the login screen. The results were clear: Vevo saw an almost six percent increase in signups! Sometimes the simplest tests are the most valuable. One of the most respected media organizations in the world found this to be true. The organization tested three different options on the call-to-action screen prompting upgrades to premium membership. One option, which just included the benefits of a premium subscription, had no significant impact. Another version that included the benefits as well as the subscription cost was disastrous — if they had released that option broadly they would have experienced nearly a 10% decrease in premium conversions. Meanwhile, one variant was a clear winner. Changing the description of the premium membership in a specific way led to more than a 15% increase in premium subscriptions. With the right technological solution in place, running these types of experiments takes just minutes to set up. As a result, organizations are able to significantly increase their ability to run more experiments, testing dozens of ideas: some will be huge hits, some will have no impact, and some will be duds. Ultimately, the amalgamation of learnings leads to substantially better retention and thus growth.